Jessica Simpson joined Crystal Renn at the 27th Annual Footwear News Achievement Awards, hosted yesterday at the IAC Building in New York City. 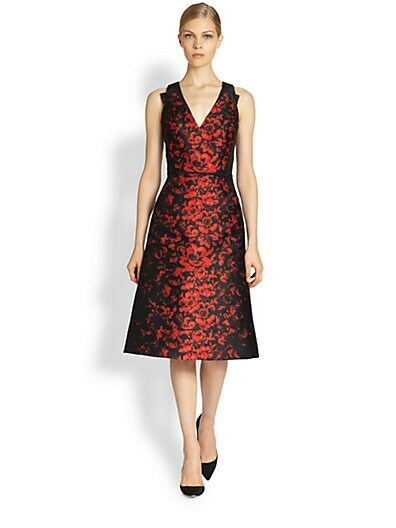 The entertainer selected a black-and-red Carolina Herrera rose jacquard cocktail dress that may have been a smidge too small through the cleavage-confining bodice. Thee frock itself was fine enough, but factor in the compromised silhouette, along with the black platform pumps, a long mane of icy-blonde locks and a significant smokey eye, the look lost some of its appeal to me. Were you let down by the styling, as well?